Crosman is one of the biggest manufacturers of guns in the world, and they always endeavor to make all their products the best in the market. Benjamin has always been one of the dominant manufacturers of airguns both PCP and CO2 in America. Check out this Benjamin discovery air rifle review for a detailed description of this pre-charged pneumatic (PCP) CO2 air rifle. Here is a quick recap on what we think of this rifle. 1.What is the legal disclaimer on this air rifle? 2.How can this air rifle be maintained? 3. What pellets are recommended for use with this air rifle? 5.Does this air rifle shipped internationally? Crosman was established in Rochester, New York in 1923 by the Crosman Arms Company. It has been committed to the manufacturing of air guns and ammunition since the beginning with innovation and quality as its main values. In 1994, the Benjamin Sheridan Factory was closed, and it relocated to Crosman Central in New York. The discovery air rifle is an HPA (High-Pressure Air) or PCP (pre-charged pneumatic) airgun. A PCP air rifle is one that uses high pressure compressed air for shooting, while a CO2 powered air rifle uses carbon dioxide cartridges. The unit has a sleek appearance and a hardwood stock that looks good on the hand. For any gun enthusiast who also loves shooting, this is the perfect choice for purchase. It has a highly accurate bolt action. This Discovery air rifle leaves much to be discovered as it continually impresses its users. It can shoot without troubles or worries about outdoor temperature since once it is filled, there is no need for pumping. Our Benjamin discovery air rifle review will help you learn a lot about this air rifle before finalizing your purchase. It also elaborates in details on the specs, features, pros, and construction of this product. This product combines the PCP and CO2 operations which excites all its users at a friendly price level. With this air rifle, you can use HPA of 2,000 psi to send pellets flying towards your target at up to 800 fps. It is highly accurate and can be used for plinking, hunting of small games from a distance and target shooting. It is not affected by outdoor temperature like other CO2 air guns, and so it is excellent for indoor use. The air rifle is highly potent. It has enough rability to aid entry-level shooters and make up for shooter errors. Also, its power level suits and excites professional shooters, making this Discovery air rifle the perfect choice irrespective of skill level. This air rifle has a 2000 psi level, and a high-pressure hand pump (not included in the rifle purchase) can be used to fill it with compressed air. Once it is loaded, you can continually shoot until there is a need to be refilled. The power plant of this air rifle is mainly PCP, but it can be converted into CO2 operation with a wallet-friendly dual fuel fill adapter (not included in the package). The CO2 operation makes it easier to fill from a paintball tank which would offer more shots than a single fill. Also, the CO2 operation can be used superbly for both indoor use and outdoor hunting. This air rifle comes with three stages classic hand pump that is light, easy to use in filling the air rifle. A one-year warranty can enhance your confidence in its purchase. It is a trouble-free air rifle and does not require very complicated maintenance and cleaning just so it can last long. Also, outdoor air temperature does not affect shooting in any way. 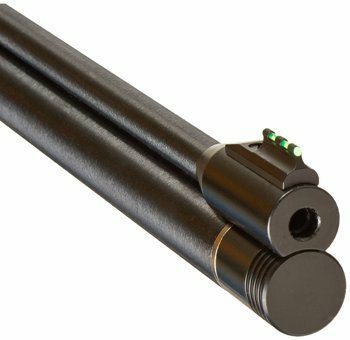 This product tends to make a lot of noise during shooting, but this problem can be solved by purchasing a silencer of the Crosman brand. This product is very accurate and can be used to get great groupings from a distance. It can be used to shoot at animals that are at a far distance without missing. Its superb accuracy also makes it an excellent choice for target shooting. 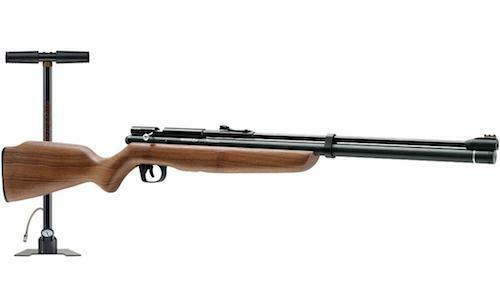 This air rifle is very light, and you can carry it around while hunting without feeling tired. Also, users who spend hours hunting either as a sport or for pest control enjoy this product because it comes with a light hand pump and so they don't have to carry heavy compressed air tanks. 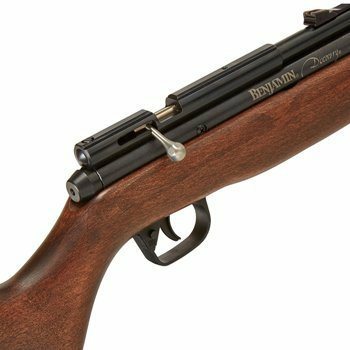 In this Benjamin Discovery Air Rifle review, it is necessary to adequately examine the pros and cons of this product to make you aware of its perks and pitfalls. Before you purchase this air rifle, it is required that you are 18 years of age or above. Also, it is not shipped to New York and its five main sections. Though this air gun is mechanical, it is very low maintenance. One can easily maintain it by following the instructions in the manual. The Crosman Premier domed and the RWS Superdome are highly recommended for using with this air rifle. 4.How do I convert to CO2 from PCP? To do this, you have to buy a CO2 fill adapter which does not come with this air rifle. Also, instructions for operating this air rifle with CO2 are not included in the owner's manual. No, this air rifle does not shipped outside U.S.
6. Does over filling increase the performance? No, this product was made for 2,000 psi, and overfilling does not increase performance. It only lessens the air rifle performance and may stop the valve. 7.Is there a warranty program on this product? Yes, there is a one-year limited warranty on this air rifle that starts from the date of its purchase which applies to defects in workmanship and material. Also, it is necessary that you retain the original receipt of your purchase for you to qualify for this program. This air rifle is extremely powerful and accurate. It can be operated with both PCP and CO2 as a power source. In a market where there are different brands of expensive PCP or CO2 air guns, this air rifle comes with a dual power source at a wallet-friendly price. We have elaborately described this air rifle specs, features, pros, and cons in this Benjamin discovery air rifle review. We rate this air rifle 4.5 stars out of the possible 5.0. Hi, Roderick here! I love to hunt and shoot. I started hunting at a very young age of 18 when I used to go with my father to hunt deer. As time passes, my interest in hunting kept increasing. With all the knowledge and experience, I thought that I should write insightful and thoroughly researched content on hunting equipments for my readers. I just passed this onto a colleague who was doing a little analysis on this. And he in fact bought me breakfast..Thnx for the treat!